A tenant of a landlady on Prince Jamiu Oyebade Street, Ogijo, Ogun State, has died from injuries he sustained in the hands of some power-drunk soldiers attached to 174 Battalion, Ikorodu, Lagos State. The victim, 40-year-old Adeola Oyekan, who traded in clothes, died on Friday on the way to the Ikorodu General Hospital, where he was referred to from Healer Hospital – a private facility in Ogijo. SUNDAY PUNCH learnt that one Tunji said to be the son of the landlady had brought soldiers from the batallion on March 8 to deal with the couple for allegedly being rude to his mother. It was gathered that the soldiers barged into the couple’s apartment and beat them up. Not satisfied, they reportedly took them to their barracks in Ita Oluwo, for another round of torture during which his jaws and neck were affected. Our correspondent was told that the soldiers dispossessed Oyekan of a Nokia phone and a sum of N84, 000 found on him. After the assault was reported at the Ogijo Police Division, he headed to Healer Hospital, where he had been receiving treatment until Friday, when his health condition deteriorated and he was referred to the general hospital. The deceased’s wife, Mrs. Glory Fagbayide, who spoke with our correspondent on the telephone on Saturday, said the landlady and Tunji had been arrested by the police. She also demanded the immediate arrest of the soldiers and subsequent prosecution of all the suspects involved in her husband’s death. She said, “On March 7, Tunji accused us of being rude to his mother. The following day, he brought four soldiers, one of whom was in uniform, into the house. They slapped and punched my husband. They injured my finger while I was trying to get him out of their grip. “They took us to their barracks in Ita Oluwo and started beating him again. When some of their bosses were passing by, they stopped the beating and shielded us from them. When the bosses left the scene, they continued to beat him. “He could not eat solid food because his teeth were badly affected and he was in pain. On Friday, his condition worsened and I rushed him to Healer Hospital again. The doctor gave him injection and prescribed some drugs for him. We just got married in September 2016. The deceased’s elder sister, Mrs. Damilola Odufaya, said his body had been deposited in a morgue in Sagamu. “After the torture, a lawyer to the landlady begged him for settlement because he wanted to sue her and the son. They promised to give him N60, 000 for the treatment. The landlady was inside when his corpse was brought home yesterday (Friday), but she didn’t come out,” Odufaya added. The Ogun State Police Public Relations Officer, ASP Abimbola Oyeyemi, confirmed the incident, assuring the deceased’s family that all the perpetrators would be brought to book. 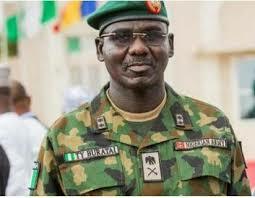 The acting Deputy Director, Army Public Relations, 81 Division, Olaolu Daudu, promised to get back to our correspondent on the matter. He has yet to do so as of the time of filing this report.